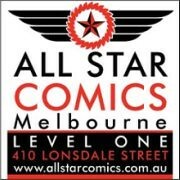 There have been quite a few characters that have started their fictional lives in animated superhero cartoons and then later been introduced into continuity in comic books. Most of those that come to mind are from the DC Universe. A notable exception to this is Marvel’s Firestar, who began her life in The Amazing Spider-Man and Friends cartoon in the early ‘80s. Firestar was created when the originally intended character, The Human Torch, was unavailable due to rights issues. Four years later, Firestar became an official part of the Marvel Universe when she was introduced in Uncanny X-Men #193, and went on to become a founding member of the New Warriors and ultimately a short but successful career as an Avenger. After many requests from fans, Bowen Designs has released a mini-bust of Firestar sculpted by Mike Cusanelli. This bust is somewhat faithful to both her animated appearance and her first appearance in the comic book world. It has her trademark mask, which she abandoned for many years in favour of various goggles, although she has recently gone back to a form of them. 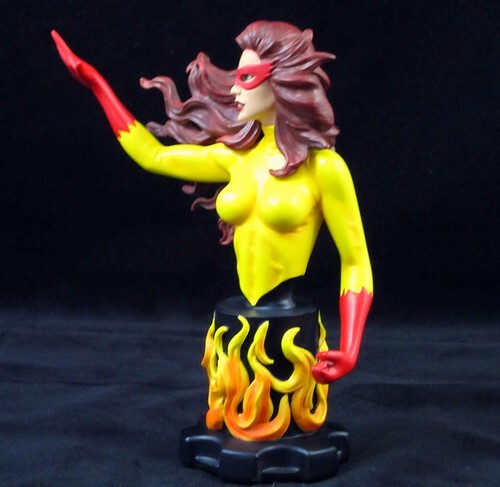 Between her associations with a classic cartoon, the X-Men, Avengers and more, Firestar is character that many fans were keen to add to their Bowen collection. Unfortunately, the excitement of this release has been dampened by two issues. The first is one of design, and the second is a paint QC issue. Mike Cusanelli is a very talented sculptor, and females are his specialty. In addition to his work with Bowen, he produces resin kits which are generally beautifully designed females. It’s odd, then, that the pose chosen for Firestar really comes up lacking. 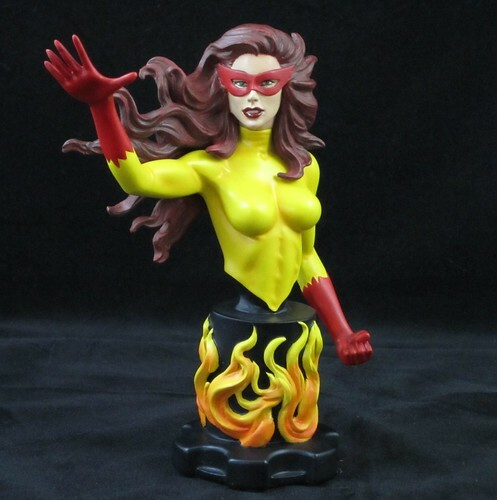 The sculpting itself is beautiful – particularly Firestar’s lovely flowing hair, but there’s little energy in Firestar’s pose or facial expression – she looks more like she’s about to hail a taxi than use her considerable powers. The lack of energy coming from her face doesn’t assist. Further, the painted flames on Firestar’s base just don’t stand up against the translucent flames on recent busts like Pyro and Daimon Hellstrom. At one stage it was stated that the flames would be produced as translucent in the final product, but this didn’t come to pass. Finally, Firestar’s eyes are quite out of alignment, with the left eye being higher than the right. At first I thought this was a paint issue, but it seems that’s the way it was sculpted. It’s even evident in the promo shot on the Bowen site. It’s just off enough to be noticeable. The real issue for me, however, is some of the worst paint slop I’ve seen on a statue, certainly on a Bowen piece. The flesh paint on her face bleeds well into the hairline on the right side of her face. This flaw doesn’t come out as dramatically in my photos as it appears in person. Often you notice these things and then after awhile you stop seeing them, however this piece has now been in my display for a few weeks and I still notice the misaligned eyes and paint slop each time I walk past. It’s a real disappointment from Bowen, considering that the QC on their pieces are usually very reliable. I very much like the Firestar character, so until such time as she gets either a Full Size release or a Modern Age bust, this piece is going to stay in my display, but I have to declare it an unfortunate “miss” from my favourite statue and bust producer. Cusinelli has two female busts coming up from Bowen – Enchantress and the web exclusive Hela. They both look fantastic in their promo shots – let’s hope that translates to what we see on our shelves! Also, don’t forget to check out the two contests we have going at the moment: the “That ‘70s Custom” Custom Contest and the third round of our first “Toy Lines!” Caption Contest! I don't hate this piece, but I still prefer her previous mini bust over this one. Oh dear! That is a bit of a miss for Bowen. That seems like a disappointment all round then. Man, this looks really bad, even with just a glance at that first pic. Reminds me of those cheap knockoffs or plaster cast pieces I see now and again.